A consistent code leads to a clear view which in turn results in the potential for more code reuse. This drastically reduces the cost and development effort. Higher the complexity of a code the more vulnerable it is to errors. 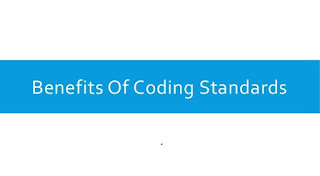 Coding standards help develop software programs with reduced complexity thereby minimizing errors. Many a time IT projects fail due to software development problems. Coding standards reduce the risk of failures. It has been observed that software developers spend a significant amount of time in resolving issues that could have been prevented. Establishing coding standards enables the team to detect problems early or prevent them entirely. This enhances the efficiency throughout the software process. If a source code is consistent it can be easily maintained. This is because anyone can step in at any stage maintain it or incorporate any modifications. A consistent source code makes it easy to locate and correct bugs in the software. A consistent source code facilitates a clearer view of how the code fits within the larger application or the company as a whole. Note:If you want more about coding standards please see this - What is coding standards?